Planning a party and need help deciding how much (craft) beer to order? Short’s Brewing Co. has an app for that. Are you planning a special event and need some help figuring out how much beer to plan for? Well, the good folks at Short’s Brewing Co. have created a very handy tool for just that kind of brainteaser. 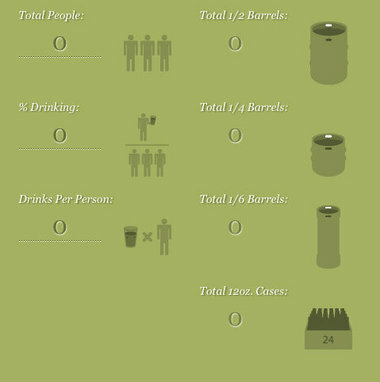 Their new app will help you calculate how much beer you need based on the total number of guests, percentage of guests who drink beer, and the number of drinks per person. Their Beer Ordering Calculator will advise you how many 1/2 barrels, 1/4 barrels, 1/6 barrels, or 12 oz. cases you should plan for. It’s probably best to round up or even pad it a little (good craft beer tends to runs out fast). I also briefly tested this on my smartphone and it worked pretty well with my browser — in case you need to recalculate on the fly.